Robbed? Or fair game for Shaun Marsh? Pat Cummins brought up Australia's first half-century of the match after Australia wagged the tail and denied India a day four victory in Melbourne. Australia goes to bed two wickets away from defeat with Cummins and Nathan Lyon (6*) at the crease overnight. 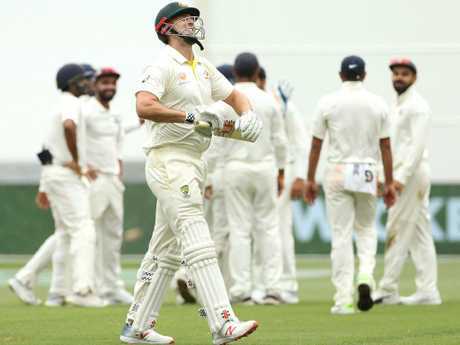 Yet another failure from Australia's top six saw the last sliver of hope in a home side victory dashed as India replicated their first innings masterclass with the ball. Ravi Jadeja found some purchase off the day four track, taking three top order wickets from a whopping 32 overs. Shaun Marsh's dismissal on day four left a host of fans bewildered after a polarising DRS decision sent him back to the sheds on 44 in Australia's chase. The Aussie batsman was caught off-guard by a skidding delivery hitting him in line with leg stump and was given out by Marais Erasmus. The Aussies went upstairs to review the decision, clearly confident in the ball travelling too far down leg. 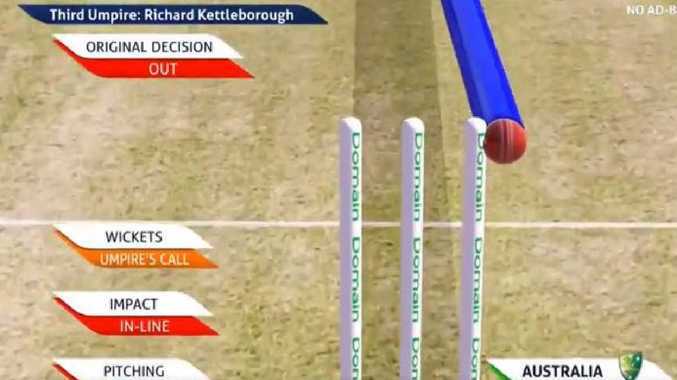 Surprisingly third umpire Richard Kettleborough reverted back to Erasmus' original decision despite seeing evidence of the ball barely scraping the right peg. Fans were up in arms at the decision, suggesting the ball tracking technology got it wrong in predicting the ball to straighten up. Australia found a new favourite sledger in Tim Paine after his chatter behind the stumps asking Rishabh Pant to babysit his kids was broadcast around the nation, but it looks like the 21-year-old India star had the last laugh in Melbourne. Pant mercilessly ribbed the Aussie skipper from behind the pegs throughout his innings, referring to him as the "special guest" of the home side. "We've got a special case today, come on boys. Special appearance today boy. Come on. No responsibility there from captain," he said before ripping into Paine's position as captain. "Have you heard of a temporary captain ever? Have you heard of it? Have you heard of anything like a temporary captain ever? You don't need anything to get him out, boy. "He loves to talk. That's the only thing he can do boy. Only talking, talking." Mitchell Marsh was out for 10. Mitchell Marsh's first Test back has been a nightmare for the Wes Australian. After being booed by Victorian fans on Boxing Day, the all-rounder had a mountain to climb to convince the public he belongs in the Test side. But his performance in the second innings with Australia in dire need of a partnership was the last thing viewers wanted. An attempt at aggression against Ravi Jadeja saw him caught cleanly in the covers in one of the softest dismissals seen all match. Former Aussie opener Simon Katich was livid at the returning star's brain explosion with Australia four down and over 250 runs away from victory. "I am absolutely lost for words watching that," Katich said on SEN. "Mind you he had a bit of a tempt the over before when he was trying to take Jadeja over his head. He's on three, yes he got away with one, but now he's walking back to the pavilion," Katich told SEN radio. "That's just done him absolutely no good whatsoever in terms of his learning, in a situation he had a golden opportunity, nobody expected Australia to win from here. "Golden opportunity to learn something out in the middle under pressure, he's just squandered it again." Former Aussie captain Ian Chappell says the problems plaguing Australia's batting order is easy to identify, but the proper solution could be impossible to find before the Sydney Test. The ex-Channel Nine commentator said the fact the only other form of cricket being played in Australia at the moment - the T20 Big Bash - has made it harder for selectors to guess red ball form from domestic players. "The problem with Australia's batting is that you have guys struggling at Test level," Chappell said. "You can criticise them for getting a start and getting out, but lets be realistic about it, some of them are struggling to hold their head up at Test level. "The problem that the selectors have got is - it's fine to start dropping people - at this stage (Aaron) Finch and Mitch Marsh you can't mount an argument to retain them in the next Test match - but the big question is if you drop them where do you go? "And made more difficult for the selectors by the fact the only cricket going on in Australia at the moment is T20 cricket and the BBL. "If they're going to make some changes, they've got to make them from the BBL. "I wouldn't particularly want to be a selector at the moment."